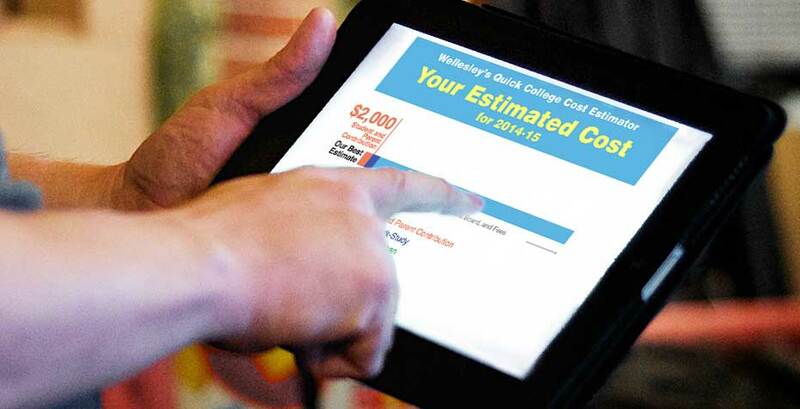 Wellesley College today released an updated version of its groundbreaking college cost estimator. My inTuition: Wellesley’s Quick College Cost Estimator asks just six basic financial questions before providing a personalized estimate of an individual’s cost to attend Wellesley. The new version provides a breakdown of the cost paid by the family, work-study, and loan estimates, in addition to grant assistance provided by the College. Wellesley developed My inTuition to give students a simple, accurate, and personalized estimate of their expected cost to attend the College. Since its release in September 2013, more than 26,000 estimates have been provided. Scott Juedes, director of Student Financial Services at Wellesley, believes that the tool will help prospective students understand their options when they are first looking at colleges. “The financial aid process can be very confusing and difficult to navigate. By providing a clear estimate of what it will cost individuals to attend Wellesley, we hope to bring clarity to the beginning of the process.” Juedes said that changes to My inTuition were made in response to the requests of prospective students and families who have used the tool since it was unveiled in 2013. Since 2011, the federal government has mandated that colleges and universities introduce a net price calculator to provide prospective students with an estimate of the cost of attending the institution. Although these calculators have been in place for some time, they remain difficult to use, requiring answers to 40 or more questions and access to detailed financial records. In contrast, My inTuition provides a personalized estimate of an individual’s college costs at Wellesley in approximately three minutes. The tool is free and available online.